Nail Polish Wars: Happy New Year 2015! Happy New Year everyone!!! I have been dying to try out this awesome color blind test mani that Goose's Glitter created, and today is finally the perfect day to do it!! 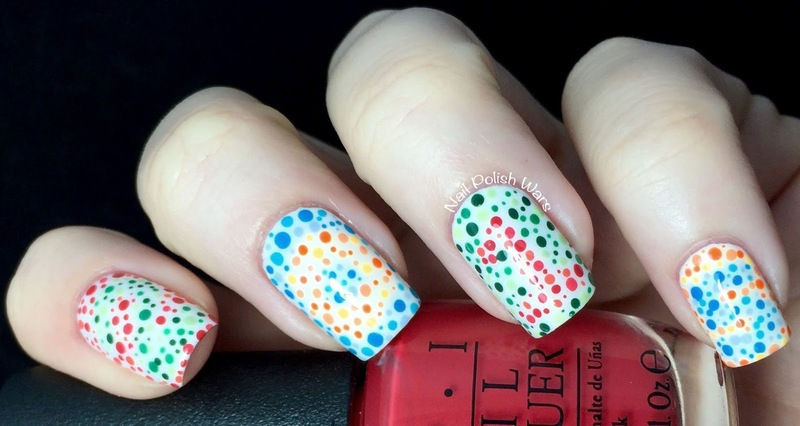 I used my smaller dotting tools and began by forming my numbers with the darkest shade for the chosen color scheme, and then dotted with the lighter shades to begin filling in the numbers. Once they were finished, I began dotting randomly in the contrasting color. I finished with one coat of SV. For the blue toned dots, I used China Glaze Sunday Funday, China Glaze Capacity to See Beyond, and Color Club In De-Nile. For the orange toned dots, I used OPI Juice Bar Hopping, China Glaze If in Doubt, Surf It Out, and China Glaze Metro Pollen-tin. 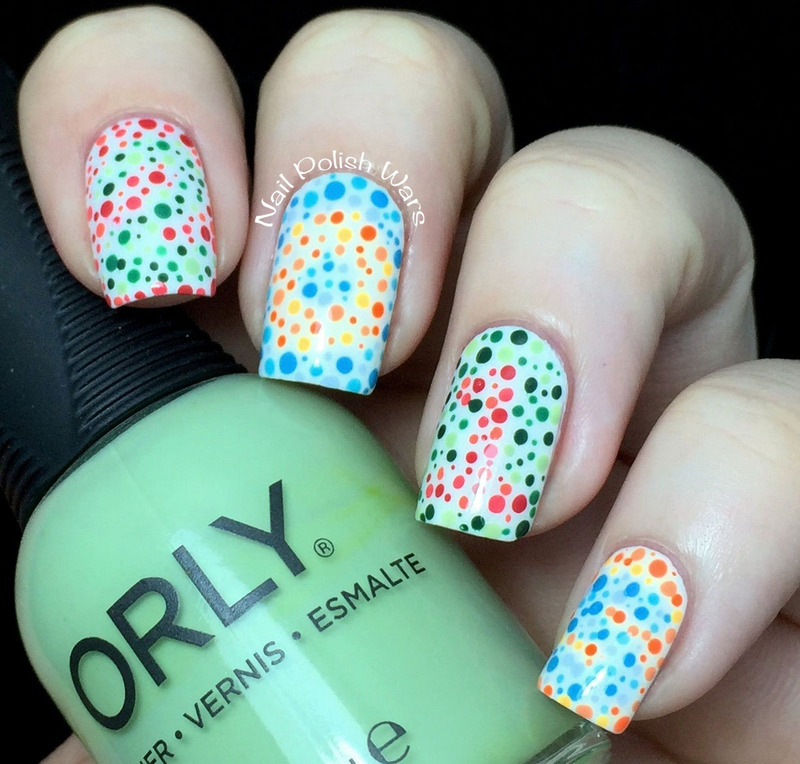 For the green toned dots, I used Orly Wandering Vine, Orly Lucky Duck, and Orly Coachella Dweller. For the red toned dots, I used OPI Short-Stop!, OPI Live.Love.Carnaval, and OPI Can't Afjord Not To. I was curious to see if the numbers would disappear!! I just love this mani! I was so crazy about it when I first saw the design in 2012, and I'm kind of kicking myself for waiting so long to try it! I hope you all had a safe and happy new year's celebration! This is such an awesome design! Happy 2015! Wow! Really cool! The numbers do disappear in black and white. Love it! 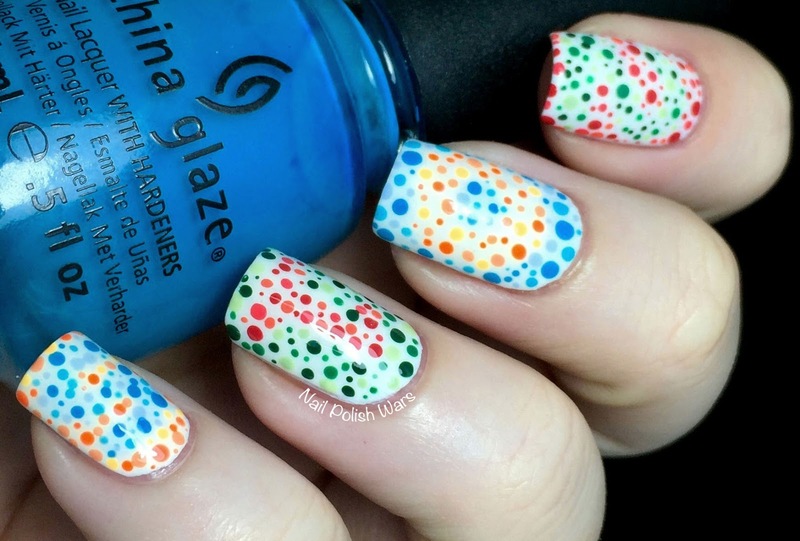 So cool that you did this design all with dots. Happy New Year! This is a very cool idea for a mani! Hi Nicole, this mani looks just like the test the eye doctor gives my sons every year at their annual exam (boys are more likely to be color blind). 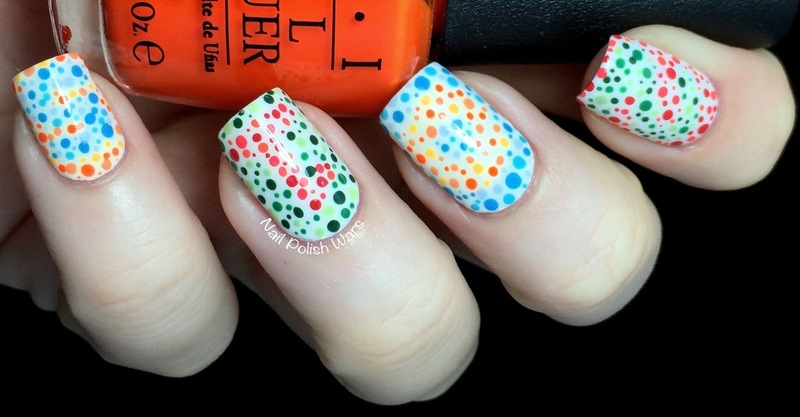 You've chosen such a unique pattern for this mani -- great inspiration! This is such a cool concept, I love it! And I love this manicure, well done! I would not have the patience, but most amazing and excellent job!!!!! These are incredible!! Wow, I love it!